The Digital 5 A Day provides a simple framework that reflects the concerns of parents/ carers as well as children’s behaviours and needs. It can also act as a base for family agreements about internet and digital device use throughout both the holidays and term time. Based on the NHS’s evidence-based ‘Five steps to better mental wellbeing’, the 5 A Day campaign gives children and parents easy to follow, practical steps to achieve a healthy and balanced digital diet. The internet has enabled everyone to maintain friendships and family relationships no matter where they are in the world and children often say that chatting with friends is the best thing about social media. It’s important to acknowledge that this is how children keep in touch but it’s also important to have a conversation with them about who they are connecting with and their privacy settings. Remember to keep a dialogue open and talk to your child to understand how they’re spending their time and so that they can come to you for help should they need to. Activity is very important for mental wellbeing and all children should have time to switch off and get moving. Children don’t have to be an athlete to be active. Find something that they enjoy – be that swimming, walking, dancing or yoga – begin at a level that works for them and make it a regular activity. Researching an activity or place online before going out is a good way of combining the two and provides an opportunity for you to use the internet together. The internet provides children with unlimited opportunities to learn and to be creative. 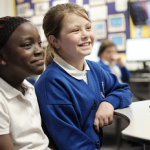 From learning to code to building complex structures in Minecraft to creating video content, the summer can be a great opportunity for children to build their digital skills. Time spent online doesn’t have to be spent passively consuming content. It can be educational, creative and can provide opportunities to build skills for later life. As well as using the internet to learn about how to get involved with local and national charitable schemes, children can give to others through their everyday activities. Remind children that by giving positive feedback and support to friends and family as well as reporting the negative behaviour of others, children can help the web make a positive place for everyone. We hear that children often feel pressured by the constantly connected nature of the internet. While they might want to do other things, it can be difficult for them to put their phones down when apps are encouraging them to engage. Being mindful about the amount of time that your child is spending online – and encouraging them to be mindful about how this makes them feel – is important. Encourage children to come up with ways of managing this i.e. keeping a diary as way of logging the amount of time they are spending online or downloading an app that helps them manage their notifications.